Las Vegas, NV -- (January 26, 2015) -- Outdoor Channel, America's Leader In Outdoor TV, unveiled the winners for its 15th Annual Golden Moose Awards, the most popular and longstanding outdoor television awards ceremony in the country, last week from the Venetian Theatre in Las Vegas. Country star and TV host Craig Morgan was among the honorees, winning the award for Best Comedy for the fifth season of his hit television series “Craig Morgan: All Access Outdoors ." Taking place during the Shooting, Hunting, Outdoor Trade Show (SHOT Show), the Golden Moose Awards honor the producers and on-air talent from Outdoor Channel's industry-leading programming. 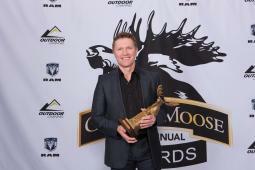 As host of Outdoor Channel’s “Craig Morgan: All Access Outdoors,” Morgan was honored to present at the 15th annual ceremony in addition to being recognized for Best Comedy. The Black River Entertainment recording artist has previously been presented with Golden Moose Award trophies for Best Turkey, Best Deer and the 2013 Humanitarian Award for his work with Folds of Honor in support of our military men and women. One of country music’s best-loved artists, Craig Morgan has made a name for himself with massive radio airplay of his signature hits: “Bonfire,” “Almost Home,” “Redneck Yacht Club,” “That’s What I Love About Sunday,” “International Harvester” and "This Ole Boy.” He's recently released his new album The Journey (Livin’ Hits) on Black River Entertainment, featuring the singles "Wake Up Lovin’ You" and “We’ll Come Back Around.” Craig received one of country music’s highest honors when he was inducted as a member of the Grand Ole Opry in 2008. Prior to becoming a country music and TV sensation, Craig Morgan spent seventeen years serving our country in the Army and Army Reserves. He is an avid supporter of America’s military personnel and a recipient of the 2006 USO Merit Award. In addition to a prolific country music career, he hosts the award-winning show “Craig Morgan: All Access Outdoors," airing on Outdoor Channel. For more information on Craig Morgan, visit www.craigmorgan.com and engage with him on Facebook , Instagram > and Twitter.